Gingerol, properly as -gingerol, is a chemical compound found in fresh ginger. Chemically, gingerol is a relative of capsaicin and piperine, the compounds which give chilli peppers and black pepper their respective spiciness. It is normally found as a pungent yellow oil, but also can form a low-melting crystalline solid. Cooking ginger transforms gingerol via a reverse aldol reaction into zingerone, which is less pungent and has a spicy-sweet aroma. When ginger is dried or mildly heated, gingerol undergoes a dehydration reaction forming shogaols, which are about twice as pungent as gingerol. This explains why dried ginger is more pungent than fresh ginger. Ginger also contains -gingerol, -gingerol, and -gingerol, collectively deemed gingerols. -Gingerol administered by intraperitoneal injection has been used to induce a hypothermic state in rats. Gingerol seems to be effective in an animal model of rheumatoid arthritis. Gingerol and its analogues have a favourable toxicity profile, but are cytotoxic towards a range of cancer cell lines including blood cancer and lung cancer. Gingerol has been investigated in vitro for its effect on cancerous tumors of the bowel, breast tissue, ovaries, and pancreas, with positive results. The product is sometimes used for gingering of horses, a practice that is seen in the horse show world, and which is illegal in some, but not all disciplines. Both ginger (Zingiber officinale) and turmeric (Curcuma longa) had been suspected to utilize phenylpropanoid pathway and produce putative type III polyketide synthase products based on the research of 6-gingerol biosynthesis by Denniff and Whiting in 1976  and by Schröder's research in 1997. 6-Gingerol is the major gingerol in ginger rhizomes and it possesses some interesting pharmacological activities like analgesic effect. While the biosynthesis of 6-gingerol is not fully elucidated, plausible pathways are presented here. In the proposed biosynthetic pathway, Scheme 1, L-Phe (1) is used as the starting material. It is converted into Cinnamic acid (2) via phenylalanine ammonia lyase (PAL). Then it is turned into p-Coumaric acid (3) with use of cinnamate 4-hydroxylase (C4H). 4-coumarate:CoA ligase (4CL) is then used to get p-Coumaroyl-CoA (5). P-Coumaroyl shikimate transferase (CST) is the enzyme that is responsible for the bonding of shikimic acid and p-Coumaroyl-CoA. The complexed (5) is then selectively oxidized at C3 by p-coumaroyl 5-O-shikimate 3'-hydroxylase (CS3'H) to alcohol. With another action of CST, shikimate is broken off from this intermediate, thereby yielding Caffeoyl-CoA (7). In order to get desired substitution pattern on the aromatic ring, caffeoyl-CoA O-methyltransferase (CCOMT) converts the hydroxyl group at C3 into methoxy as seen in Feruloyl-CoA (8). Up until this step, according to Ramirez-Ahumada et al., the enzyme activities are very active. It is speculated that some polyketide synthases (PKS) and reductases are involved in final synthesis of 6-Gingerol (10). Because it is unclear whether the methoxy group addition is performed before or after the condensation step of the polyketide synthase, alternative pathway is shown in Scheme 2, where methoxy group is introduced after PKS activity. In this alternative pathway, the enzymes involved are likely to be cytochrome p450 hydroxylases, and S-adenosyl-L-methionine-dependent O-methyltransferases (OMT). There are three possibilities for the reduction step by Reductase: directly after PKS activity, after PKS and Hydroxylase activity, or in the end after PKS, Hydroxylase, and OMT activity. ^ a b McGee, Harold (2004). "A survey of tropical spices". McGee on Food and Cooking. Hodder and Stoughton. p. 426. ISBN 0-340-83149-9. ^ Zick, S. M.; Djuric, Z; Ruffin, M. T.; Litzinger, A. J.; Normolle, D. P.; Alrawi, S; Feng, M. R.; Brenner, D. E. (2008). "Pharmacokinetics of 6-gingerol, 8-gingerol, 10-gingerol, and 6-shogaol and conjugate metabolites in healthy human subjects". Cancer Epidemiology, Biomarkers & Prevention. 17 (8): 1930–6. doi:10.1158/1055-9965.EPI-07-2934. PMC 2676573. PMID 18708382. ^ Park, M; Bae, J; Lee, D. S. (2008). "Antibacterial activity of 10-gingerol and 12-gingerol isolated from ginger rhizome against periodontal bacteria". Phytotherapy Research. 22 (11): 1446–9. doi:10.1002/ptr.2473. PMID 18814211. ^ Ueki, S; Miyoshi, M; Shido, O; Hasegawa, J; Watanabe, T (2008). "Systemic administration of -gingerol, a pungent constituent of ginger, induces hypothermia in rats via an inhibitory effect on metabolic rate". European Journal of Pharmacology. 584 (1): 87–92. doi:10.1016/j.ejphar.2008.01.031. PMID 18295202. ^ Funk, Janet L.; Frye, Jennifer B.; Oyarzo, Janice N.; Timmermann, Barbara N. (2009). "Comparative Effects of Two Gingerol-Containing Zingiber officinale Extracts on Experimental Rheumatoid Arthritis". Journal of Natural Products. 72 (3): 403–7. doi:10.1021/np8006183. PMC 2837120. PMID 19216559. ^ Semwal, RB; Semwal, DK; Combrinck, S; Viljoen, AM. "Gingerols and shogaols: Important nutraceutical principles from ginger". Phytochemistry. 117: 554–68. doi:10.1016/j.phytochem.2015.07.012. PMID 26228533. ^ "Ginger 'could halt bowel cancer'". BBC News. October 29, 2003. ^ Jeong, C.-H.; Bode, A. M.; Pugliese, A.; Cho, Y.-Y. ; Kim, H.-G.; Shim, J.-H.; Jeon, Y.-J. ; Li, H.; et al. (2009). "-Gingerol Suppresses Colon Cancer Growth by Targeting Leukotriene A4 Hydrolase". Cancer Research. 69 (13): 5584–91. doi:10.1158/0008-5472.CAN-09-0491. PMID 19531649. ^ Lee, H; Seo, E; Kang, N; Kim, W (2008). "-Gingerol inhibits metastasis of MDA-MB-231 human breast cancer cells". The Journal of Nutritional Biochemistry. 19 (5): 313–9. doi:10.1016/j.jnutbio.2007.05.008. PMID 17683926. ^ Rhode, Jennifer; Fogoros, Sarah; Zick, Suzanna; Wahl, Heather; Griffith, Kent A; Huang, Jennifer; Liu, J Rebecca (2007). "Ginger inhibits cell growth and modulates angiogenic factors in ovarian cancer cells". BMC Complementary and Alternative Medicine. 7: 44. doi:10.1186/1472-6882-7-44. PMC 2241638. PMID 18096028. ^ Park, Yon Jung; Wen, Jing; Bang, Seungmin; Park, Seung Woo; Song, Si Young (2006). "-Gingerol Induces Cell Cycle Arrest and Cell Death of Mutant p53-expressing Pancreatic Cancer Cells". Yonsei Medical Journal. 47 (5): 688–97. doi:10.3349/ymj.2006.47.5.688. PMC 2687755. PMID 17066513. ^ Denniff, Phillip; Whiting, Donald A. 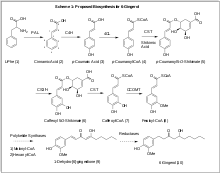 "Biosynthesis of -gingerol, pungent principle of Zingiber officinale". Journal of the Chemical Society, Chemical Communications (18): 711. doi:10.1039/C39760000711. ^ Schröder, Joachim. "A family of plant-specific polyketide synthases: facts and predictions". Trends in Plant Science. 2 (10): 373–378. doi:10.1016/S1360-1385(97)87121-X. ^ a b Ramirez-Ahumada, Maria del Carmen; Timmermann, Barbara N.; Gang, David R. "Biosynthesis of curcuminoids and gingerols in turmeric (Curcuma longa) and ginger (Zingiber officinale): Identification of curcuminoid synthase and hydroxycinnamoyl-CoA thioesterases". Phytochemistry. 67 (18): 2017–2029. doi:10.1016/j.phytochem.2006.06.028. PMID 16890967.